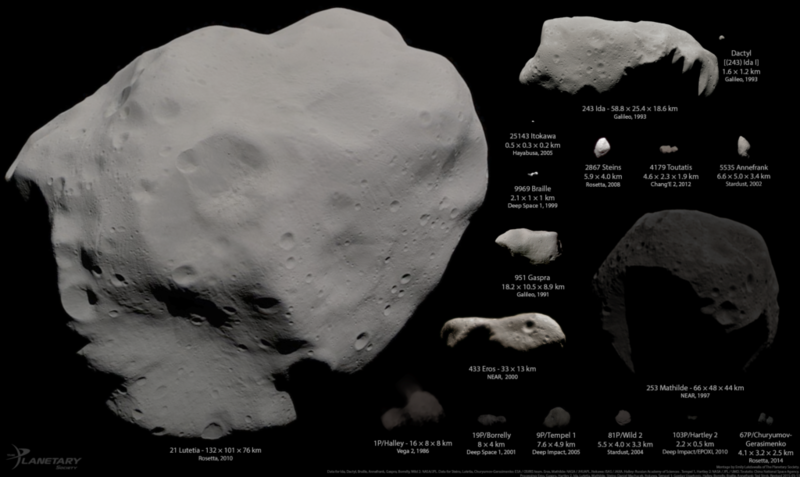 A montage of 17 of the 18 asteroids and comets that have been photographed up close as of August 2014, when Rosetta arrived at comet Churyumov-Gerasimenko. This version is in color and shows the bodies at their correct relative (though not absolute) albedo or brightness. Not included are Vesta or Ceres, both of which are many times larger than Lutetia. Image Credit: Montage by Emily Lakdawalla. Data from NASA / JPL / JHUAPL / UMD / JAXA / ESA / OSIRIS team / Russian Academy of Sciences / China National Space Agency. Processed by Emily Lakdawalla, Daniel Machacek, Ted Stryk, Gordan Ugarkovic. The mining of resources contained in asteroids, for use as propellant, building materials or in life-support systems, has the potential to revolutionize exploration of our Solar System. To make this concept a reality, we need to increase our knowledge of the very diverse population of accessible Near Earth Asteroids (NEA). Last year, dozens of the world’s leading asteroid scientists and asteroid mining entrepreneurs came together in Luxembourg to discuss key questions and identify scientific knowledge gaps. A White Paper outlining the results of that discussion, “Answers to Questions from the Asteroid Miners” was presented at the European Planetary Science Congress (EPSC) 2017 in Riga on Tuesday, September 19, by Dr. JL Galache and Dr. Amara Graps. The White Paper covers questions surrounding the need for asteroid surveys in preparing for mining missions, the asteroid’s surface and interior, implications for astrobiology and planetary protection and other questions relating to policy and strategy for developing a roadmap for advancing asteroid in-space resource utilization. 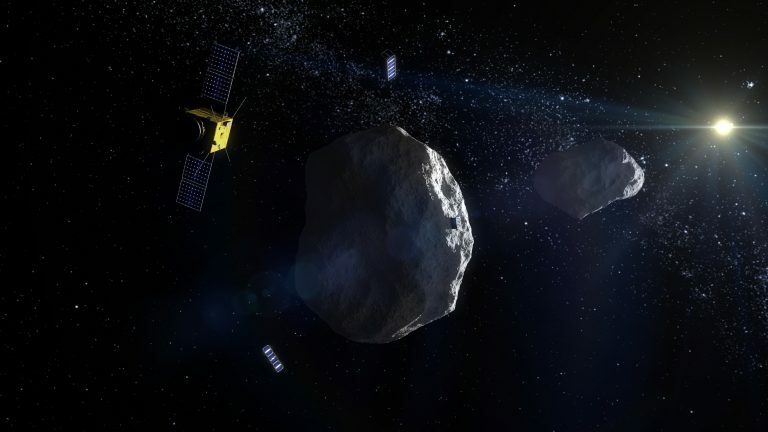 A number of knowledge gaps were identified: the asteroid miners need access to a map of known NEAs with an orbit similar to the Earth so that they can fine-tune their selection of potential targets. Many objects are – as yet – undiscovered, or very little is known about them, so there is also a need to develop a dedicated NEA discovery and follow-up program. Three quarters of known asteroids are classed as Carbonaceous or “C-type”, dark, carbon-rich objects. However, most NEAs are from the Silicaceous “S-type” class of asteroids, which are reddish-coloured stony bodies that dominate the inner Asteroid Belt. For asteroid miners looking for water to use in rocket fuel or life support systems, being able to identify the class of asteroid is vital. Carbonaceous chondrite meteorites have been found to contain clay minerals that appear to have been altered by water on their parent body. While these meteorites are thought to be derived from sub-classes of C-type asteroids, there is not an exact match with any single spectral class. A short-cut to understanding an NEA’s composition could be to identify where in the Solar System they formed and look at the characteristics of their “orbital family”. Thus, another knowledge gap is the link is between the dynamical predictions of where an NEA originates and its actual physical characterisations. More work also needs to be done to understand the dynamics of granular material in low-gravity. Studies suggest that granular material can behave as a solid, a liquid or a gas in this environment. This behaviour will be particularly important for asteroids that are rubble-piles, as spacecraft trying to land or drill into these could easily destabilize regolith causing granular flow or avalanches.